Angels cannot be explained in rational terms. They may stand for the lost childhood that we all hold dear. The exhibition invites you to trace the angels' breath and the beat of their wings. In our mind's eye, angels are often seen as light, hovering and mysterious beings. Textiles, too, reflect this perception. In this year's special pre-Christmas exhibition, the Textile Museum is leaving its rooms to the angels. Heavenly beings on historical textiles float through the big exhibition hall as messengers, companions, protectors or warriors. In the staircase, fifteen textile artists have expressed a topical and personal relationship with the angels in their creative work. Almost all the high cultures know flying messengers as mediators between the world of gods or spirits and the earth. Thanks to their wings, they can easily move between the here and now and the beyond. Wings mean speed, the elevation of mind and soul, the motion of everything earthly towards celestial life. The Egyptians bestowed wings on a variety of godheads, but also on the uraeus snake, the cobra. The Hebrew saraph means as much as fiery snake, dragonlike creature or "the burning one". In the Old Testament, Isaiah described the seraphim as having six wings. As the snake has had negative connotations in Christian tradition ever since Adam and Eve were expelled from Paradise, the seraphim have had human form. The winged messengers of the Greek gods, called angelos, had a lasting effect on the Christian view of angels. Angels are among the most popular religious motifs. Both Christian and Islamic angels have their roots in the Jewish religion. The Bible texts only describe cherubim and seraphim as winged. All the other angels are light beings and appear in human form. During the first four centuries A.D., angels were depicted as serious, wingless and clad in costumes of antiquity. From the fifth century into the High Middle Ages, they had wings and wore sumptuous liturgical robes. Their facial expressions now conveyed joy. In the Renaissance, their wings were majestic versions of goose and swan wings. In the Baroque period, even the rustling of their wings seemed to be audible. 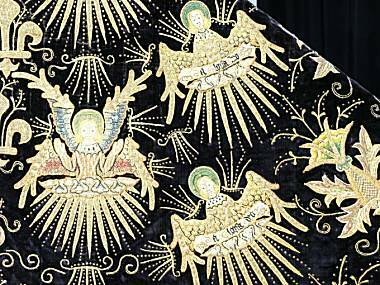 From the mid-15th century, angels' garments have consisted of long, light-coloured and precious textiles. The angels of the Old Testament are helpful rescuers but can also appear as avenging angels. With their rebellion against God, they provoke the division of the universe into good and evil. As Lord of Sabaoth, God rules the heavenly hosts. In early Christendom, this notion and the various types of angels resulted in a complex hierarchical system: distinctions were made between seraphim, cherubim and thrones, between dominions, virtues and powers, and between principalities, archangels and angels. A particularly intensive encounter with an angel is that between Mary and the Archangel Gabriel. This encounter has been depicted countless times in Christian art. Frequent motifs of the veneration of the Virgin Mary are also the Assumption and the Mother of God as Heavenly Queen. In Christian art, Jesus is accompanied by angels from his birth to his resurrection. The angels who mourn the crucified Christ in despair bear witness to the fact that as angels, they know more than human beings, but are not omniscient. Angels provide saints with help and support in their trials and tribulations. It is from this role of assistance that the guardian angels are derived. The greatest influence on the idea of the guardian angel was exerted by the legend of Tobias, whose faithful travelling companion was the Archangel Raphael. There is a close connection between the idea of the guardian angel and the angels in heraldry. Coats of arms of families and countries are often held by angels. The special mediators of Antiquity are the winged Erotes and Amores, who accompanied the goddesses of love with bows and arrows. The Renaissance turned these into putti. In the Baroque and Rococo eras, they were transmuted into playful, cheerful and chubby-cheeked cherubs. In the 19th and 20th centuries, they remained the putti armed with bows and arrows but were also extremely popular as little angels consisting only of head and wings.